After an overcast day with rain, holes started to appear in the cloud cover in the evening. 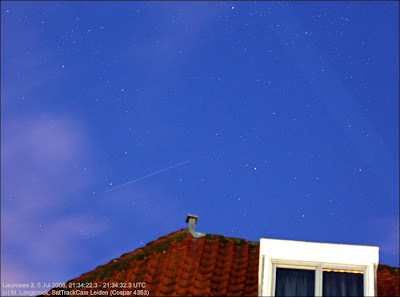 They allowed me to capture Lacrosse 2 (91-017A) in a blue twilight sky, followed by a splendid magnitude -7.5 flare of Iridium 5 close to Arcturus seen through thin hazy clouds. Lacrosse 2 flared as well to mag. -1 at 21:34:42 UTC (Jul 5). The top image below shows Lacrosse 2 in twilight. 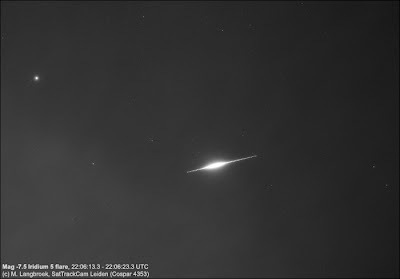 The second picture shows the Iridium flare, with Arcturus at left.